On the back of the Snowdon Stations are the Blaenau Ffestiniog Stations. The Blaenau Ffestiniog game is for 1 to 4 players only. Put the Blaenau Ffestiniog station on top of the Llanberis space on the board, then lay out the rest of the route around the board as normal. Remove Contract cards 28 and 29 from the game. Everything else (resources in the Supply Bag, action spaces, weather, and so on) is the same as the Snowdon game, except as follows. Beginning with the Start Player and continuing clockwise round the table, each player selects their starting position - Blaenau Ffestiniog or Porthmadog harbor - and puts their Surveyor in one of the three spaces at the bottom of the card. 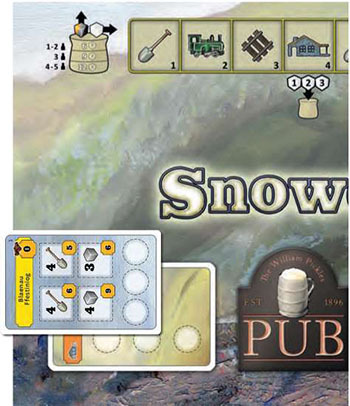 There is a fixed limit of three spaces for players' Surveyor pawns on Blaenau Ffestiniog and Porthmadog Harbor, so with 4 players it is possible that one player will not get a choice. The last player to place their Surveyor chooses one end of the route to place one of the game's Game markers (no surveyor space is required). This marker represents the game's Surveyor who will alternate between Blaenau Ffestiniog or Porthmadog Harbor as Events resolve. Put an Event cube on space 7 of the Events Track. Only spaces 8, 9 and 10 of the Events Track are used. Players can use the Build Action to build trains from the start of the game. For the Excavate and Lay Track actions each player carries out the action along the route in the direction away from that player's starting position. As soon as all rubble counters have been removed from Station 4, the 'Train maintenance is needed' event happens. Track cards do not have to be excavated before a Station card can be built upon. A player can only build on Station cards from the player's starting position up to and including the location of that player's Surveyor. Therefore, if players do not move their Surveyors, they will be unable to build sites elsewhere. Some Station cards give a player free resources each time that player builds on a non-excavation site. Take these from the Supply Bag, if available, otherwise receive nothing. When a player moves their Surveyor off Blaenau Ffestiniog or Porthmadog Harbor, put one of that player's Ownership markers in the starting Station to show that player's starting position. This means that all players, if they move, will have one less Ownership marker to use in the game. If an Event occurs, resolve it from the end of the route where the game's Surveyor is currently located - either Blaenau Ffestiniog or Porthmadog Harbor (it never moves along the route). After the Event has been resolved, move the game's Surveyor to the starting Station at the opposite end; Events alternate between the two ends of the railway route.